Crypto and bitcoin adoption — How far along are we really in this rally? I think Ari’s way of comparing the internet and crpytocurrencies is very smart and it would indeed signal that there is enormous potential left for crypto assets to continue the current bull run. However, due to the simple fact that I was hands deep into the .com bubble, every time someone writes about how low adoption still is and (implies) how much higher markets will still go, I get reminded that basically every Uber driver in London tells me about bitcoin or another token these days and how similar that is to how things unfolded in the .com bubble. So I get suspicious — especially if that person presumably has an interest in prices going higher. I wrote an earlier article about the bubble comparison if you care to have a look here. Note that the same suspicion I mention here applies to myself also. I do have an interest in prices going up further - at least subconsciously. So I decided I wanted to know for myself how likely it really is that 1994 is the correct analogy in regards to the internet comparison or rather I wanted to use a similar method to arrive at my own conclusion as to how long this current bubble will still be getting larger. The following addresses each of these points. As I said above, I think looking at cryptocurrencies this way is very smart and I am not looking to take away any of the credit from Ari here. However I disagree with using the number of bitcoin users as the best indicator. I think that there is a good case to be made that many people who entered the world of cryptocurrencies after December 2016 may have directly gone into Ethereum and from there onwards into ICOs and utility token. I am not saying they never touched bitcoin, but they might easily be lost in the statistic. Furthermore, given cryptocurrencies have started to become an expensive hobby and are really much closer to an actual investment decision these days, I do think it is fair to say that a large percentage of households will only have one cryptocurrency user and that their investment will be done in joint accounts (whether this is couples or entire families). This might also happen simply due to the age difference and the likelihood the older generations ask their children to do it for them. Basically I start with Alistair Milne’s Coinbase user number which he has been tracking nicely (check out his Twitter; thanks Alistair). Then I used coinmarketcap.com’s trading share (volume based) of Coinbase exchanges in total bitcoin trade as an indicator of Coinbase accounts as a % of the total Cryptoaccounts. Lastly, I assumed that every household has on average 4 accounts (ie some people will have 10 accounts on multiple exchanges on their own and some people will have just 1). The resulting number brings me slightly ahead of Ari’s estimation in terms of where we are regarding crypto adoption. 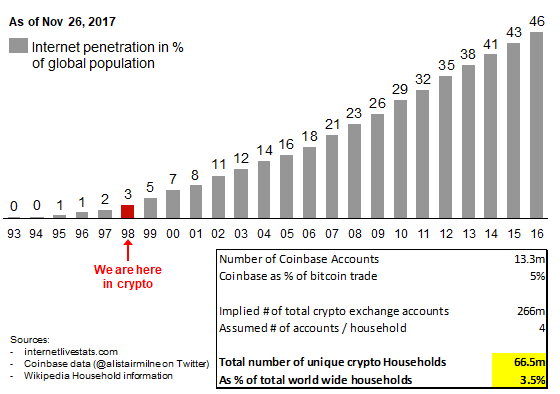 I believe that 3.5% of households are currently crypto households, which compares to about 1998/1999 in terms of internet adoption. The reason I believe that is more accurate is actually that it also ties in better with the other indicators I looked at. I can draw on two earlier posts to properly do this comparison. One is linked at the start, the other can be found here. In order to understand the numbers I am using, you will need to know that I disagree with the general view of “Total Market Capitalization” in the cryptosphere. The article I mentioned just above goes into detail as to what is wrong with it, but in summary the problem is that the current way to measure market cap in crypto disregards the supply of token/coins still held by the companies or users that gave birth to these coins. Arriving at the right number is a difficult exercise as it is clear (at least to me) that the total supply of all coins need to be taken into account for ICO token (ie the founder holdings are part of supply), while for most utility token and for bitcoin considering the supply not yet mined would not be appropriate. However, cases like Ripple make it difficult as I think every bit of the pre-mined supply here should count towards market capitalization as it can be sold any time. Any ways, when you see my numbers below, just note that I am counting total supply for token and a mix of total and circulating supply for utility token and currencies like bitcoin. Again, several assumptions are necessary. I start with saying that the proportion of value attributable to the .com bubble is 50%, which I derive from the level that the Nasdaq Composite traded at for the next few years after the bubble burst. That yields a size of 4 trillion US Dollar for the total bubble. However, to make it comparable, I believe we need to deduct the amount due to Institutional holders, as these have not yet been a major factor in crypto due to unclear regulations (even just asset custody is a night mare; good article on this by TwoBitIdiot here). So that brings it down to 10% of the total value, yielding $400bn. 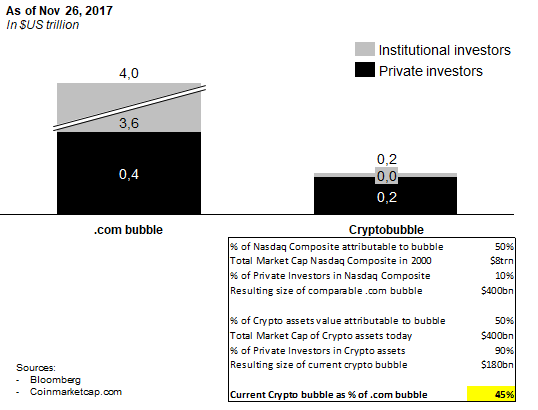 If we assume the same proportion of value attributable to the bubble in Crypto (ie 50%) and allow for 10% of Institutionals in the space, the current bubble in Crypto is c. $180bn, which is about 45% of the .com bubble. This would suggest there is quite some room left, though for reasons outlined in my earlier article I would probably say this is slightly overoptimistic. Bitcoin has undoubtedly shown a capability to store (and grow) value, so this is an interesting comparison. I find it hard to assume bitcoin will ever replace Gold given the latter’s much much longer track record, but it is absolutely not out of the question that bitcoin value could approach 10% of global Gold reserves. 1% of Gold value translates to approximately $3,500 per ultimately mined bitcoin. So we currently stand at about 2.5% of total Gold value. This suggests bitcoin could be worth $35,000 one day. There was recently an article by the FT that claimed the introduction of Futures would hail the end of the bitcoin run. I thought the idea to look at previous instances such as opening of the Japanese markets and mortgage bond indexation is a smart one. However I disagree with the author’s conclusion. As a matter of fact, as I argue here, these instances seemed to mark the start of the accelerated part of all these bubbles and while that used to be the last stretch of the bubble it typically took values a good deal higher yet for quite some time. If you look at what I stipulate here, it is interesting to see that all three parts fit together relatively nicely. All of my indicators would say that in terms of value creation we are about at the start of 1999. The .com bubble had ways to go from that point (about 130% upside was left to the March 2000 high) and internet adoption more than doubled in about two years. This does not yet say anything about the maturity of the underlying technology of course, but that taken together with the timing of CME future launching still this year leads me to believe that we are in the last leg of the current bubble in crypto. This last leg is typically the strongest one and surpasses everyone’s expectations on price, leading to a fully fledged euphoria. I have no idea where this leg will take current crypto prices, but I continue to think that the introduction of ICO regulations along with lawsuits brought against some of them by the SEC and founders potentially ending up in jail could be the catalyst for the bursting of the bubble. From there on out, Crypto/Blockchain 2.0 (or rather ICO 2.0) may very well replace current market places over the long run, but it could take a longer “digestion” period for this to emerge, just like it took years for Facebook, Netflix and Amazon to start dominating their fields. As always, a short but important disclaimer: none of what I write here is to be construed as advice to buy or sell any kind of asset. It is merely my personal and not my professional opinion. Any asset can go to zero.